Every day across Hong Kong, our WWF Ambassadors – dressed in our orange uniform bearing the panda logo and identification badges – introduce the general public to WWF’s conservation works and raise funds for various projects. If you bump into them, do spend time to catch up on our latest projects. You’re also welcome to share with them your thoughts and ideas about improving our environment! Our planet faces severe challenges. This makes me keep thinking how I can contribute more. Instead of taking actions alone, I determined to take a further step by influencing others to play their own part in cherishing the only planet that we share. This motivates me to join the WWF family. By being a WWF ambassador, I spread conservation messages on the street every day and bring people together to support WWF’s work. I believe these efforts will give our future kids a chance to see, touch and feel the beauty of the natural world. Let’s work together for this and future generations. 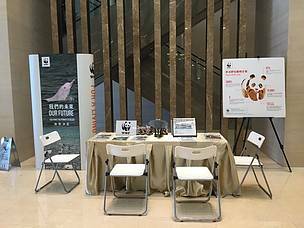 Being an ambassador of WWF, I am glad to witness how our work makes a difference in Hong Kong. Many Hong Kongers are aware of the ecological problems in our planet. Especially for parents nowadays, most of them proactively educate their children on the importance of protecting the natural environment. Even for those people who may not have a strong sense to protect the environment, they would have heard of Earth Hour and WWF’s “shark free menu” programme. All these have given me the strength to perform my work on the street. For people who haven’t joined us yet, I’m ready to be your forerunner. Let’s create a sustainable future together!